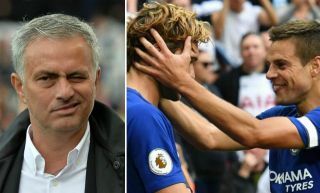 Jose Mourinho has reportedly asked Manchester United to make an offer to seal the surprise transfer of Chelsea left wing-back Marcos Alonso. According to Don Balon, the Red Devils could be prepared to pay around £70million for the Spain international, who has become regarded as one of the finest in the Premier League in his position. Back Chelsea to beat Leicester on Sunday to win £1 MILLION in Betfair’s FREE TO PLAY Pick 6 game – Follow This Link to register and play (over 18s only, one entry per customer, terms apply) Entries close at 3pm Saturday, so get your selections in before then! Alonso’s tireless performances down that left-hand side played a major role in Chelsea winning the Premier League title in such style last season, with the 27-year-old very capable at the back and going forward. Remarkably for a player whose primary role is a defender, Alonso has 13 goals in 74 appearances for Chelsea, and it’s easy to see why a club like United could be interested in him. Mourinho has rotated between Luke Shaw and Ashley Young at left-back this season, but neither looks entirely convincing as a long-term solution to that position. A specialist like Alonso would represent a major upgrade for United, who successfully raided their rivals Chelsea for the signing of Nemanja Matic last summer. They’ve also signed Juan Mata from the Blues in recent times so another deal could be possible, though Chelsea may want to think again about letting key players move to direct title rivals.